24 hours in Hamburg gave me just enough time to grocery shop at the DM and clothing label, Mango. Rathaus, Hamburg offers an abundance of shops and restaurants near the town hall, which is the beautiful building behind me in the photo above. 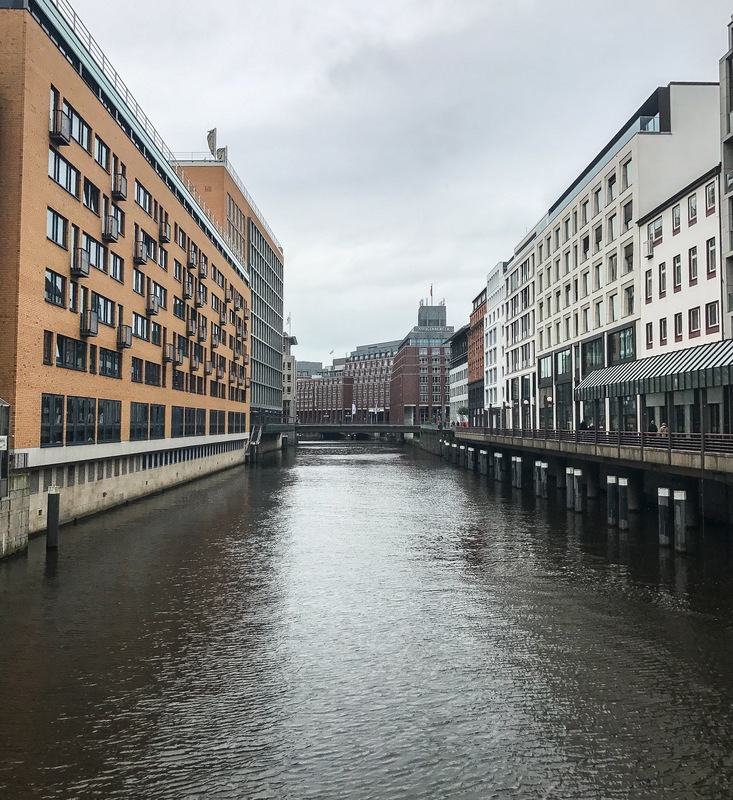 Arriving in Hamburg is always a guessing game of whether or not the weather is going to be gloomy and grey or warm and bright. I visited Hamberg on the most perfect day because it was not too hot nor cold, but enough to wear a light jacket. 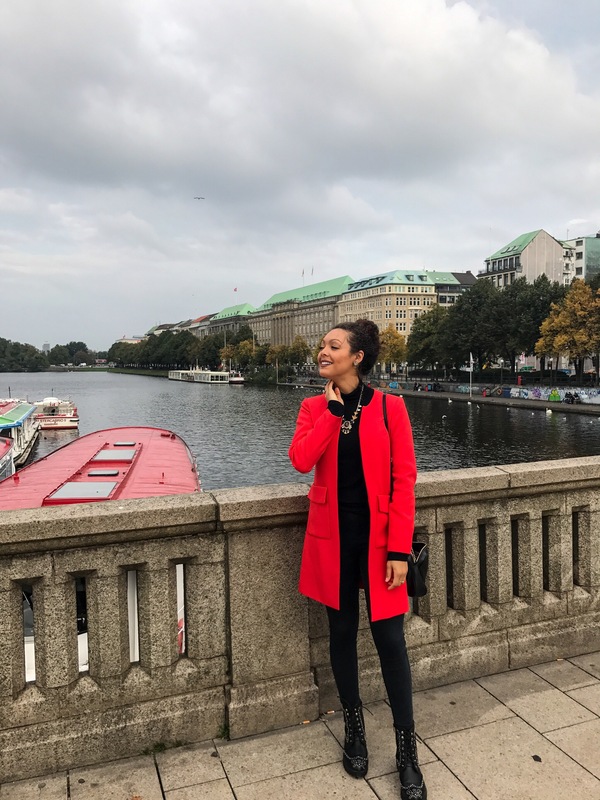 I wore this bright coral jacket to give the photo a pop of color knowing Europe is always so grey. Hamburg is the wealthiest city in Germany, so you can only imagine how gorgeous this city is, even on a rainy day. The architecture is so well-constructed and the apartment homes are original with style. Hamburg is definitely a place I would love to spend 50 more hours in just to explore more within. The inspiration for the hamburger did indeed come from Hamburg, but it is originally from German Hamburg cows. Whatever that means. I had to look that one up since I no longer eat meat. I did in fact have a veggie burger though, along with some of the best french fries (pommes frittes). You cannot go wrong with a burger, so I would definitely order one of these on the menu, or a schnitzel. Oh how the German schnitzel is mouth-watering. If you are a beer drinker then you will have a huge selection of beers cut out for you to try. If you are not too much of a beer drinker like I, I suggest you try the Radler. The Radler is a 50:50 mix between a light beer and sparkling lemonade. Even men drink it so don’t make fun! 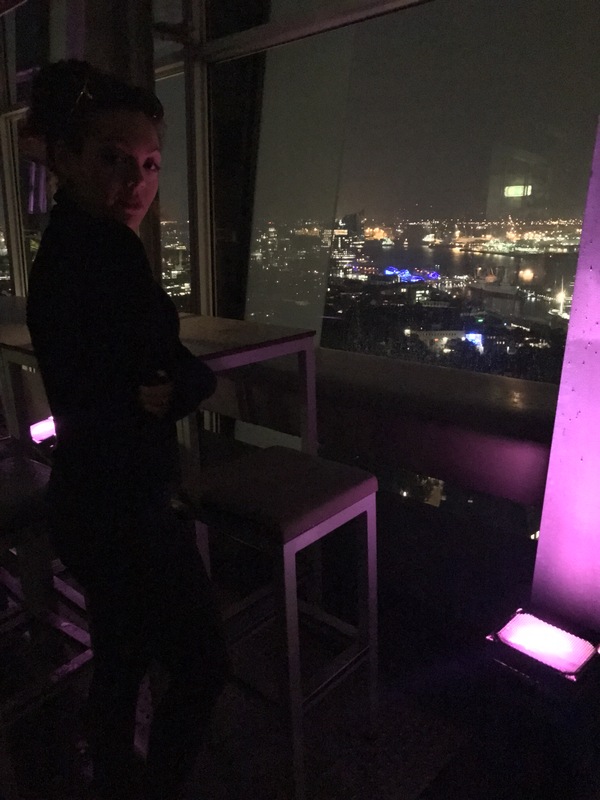 If you want incredible views of Hamburg, in addition to enjoying a cocktail or beverage, visit Empire Riverside Hotel for a gorgeous night out. If it is rainy or windy, you will only be able to access the indoor rooftop area. There are tons of rooftop lounges in Hamburg so research some around you and I am sure you will see beautiful views of this city. Need a spa day? That was a stupid question. You NEED spa day. Book a room at Sofitel Hamburg Alter Wall and you will be gifted with a spa offering warm robes upon arrival, fresh fruit water, a sauna, and a beautiful pool to swim out muscle tension. The music itself puts you in a relaxation trance making it difficult to even go to your room. I have neverThis hotel is worth it just to have this luxurious spa experience. The rooms are beyond comfortable and I cannot speak anymore highly of the beds. You will seriously have the best sleep of your life if you stay at the Sofitel. That jacket is so cute! 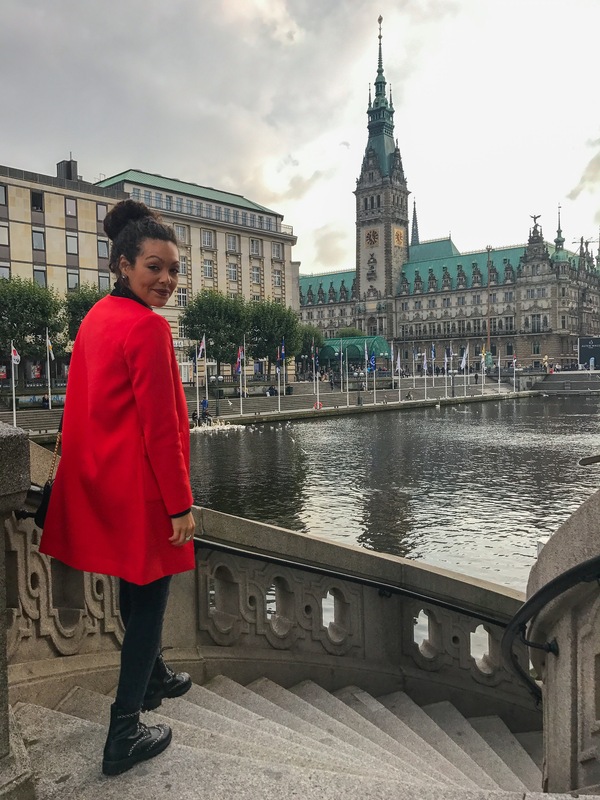 What was your favorite city in Germany?